Vocalist/ actress Vivian Reed is known far more for her long time career as a Broadway performer (WHAT a voice! 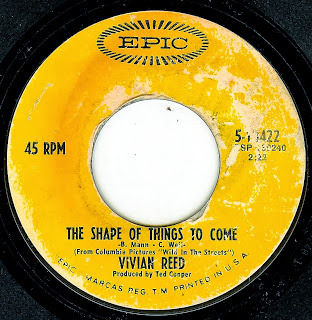 ), and "The Shape Of Things To Come" is known more for the version by the faux-group Max Frost And The Troopers (as heard in the teen exploitation flick Wild In The Streets). While the "Max Frost" version is lots of fun, Vivian's take allows the song to truly reach the potential of the lyrics without any irony or cornball factor. Considering the year that it was released (which was full of turmoil, unrest and horrifying assassinations), this version completely levels the original.